From the Planes You’ve (Probably) Never Heard Of Department of Wingspan, we bring you the Curtiss XF14C. “Speed is life” is an old axiom among fighter pilots, and being faster than your opponent, and maintaining that energy, is essential in a dogfight. Therefore, the quest for speed in military aviation remains a constant search to this day. In January 1941, the US Navy placed a request for a high-performance carrier-borne fighter, one that would use an experimental engine that was hoped would push a new fighter to 424 mph. Unfortunately for Curtiss, that estimate turned out to be rather optimistic. The US Navy had a long history with air-cooled radial engines. Not only do they produce large amounts of power, they are also relatively easy to maintain. And by 1941, radial engine technology was beginning to reach its zenith. Which makes it odd that the Navy would get behind the Curtiss XF14C, which was designed to be powered by a radical new water-cooled hyper engine. Back in 1932, Lycoming began work on the O-1230, a flat-twelve engine that they hoped would produce one horsepower per cubic inch of displacement. With the modest success of this engine, Lycoming doubled down and essentially placed one O-1230 atop another to produce a horizontally opposed 24-cylinder engine, with each pair of six pistons operating opposed to each other in an H configuration. The resulting engine, known as the H-2470, had a displacement of 2,467.8 cubic inches and made 2,300 hp. Lycoming had just about reached their target. The Navy authorized the construction of two prototypes, designated XF14C-1, with the Lycoming engine turning a pair of contra-rotating propellers. Curtiss got to work, but continued problems with the H-2470 led to its eventual cancelation. Curtiss was forced to replace the Lycoming engine with a turbo-supercharged Wright R-3350 Duplex Cyclone, an 18-cylinder air-cooled radial engine which produced the same horsepower as the H-2470, and the XF14C-1 took its maiden flight in July 1944. But even with such a powerful engine, the fighter, now designated XF14C-2, failed to live up to its billing. Where Curtiss had hoped to reach a top speed of 424 mph at 32,000 feet, the prototype could only muster 398 mph. It did, however, attain its planned service ceiling of 39,500 feet. The contra-rotating props also produced a serious vibration, and the aircraft’s empty weight was more than a thousand pounds greater than the Vought F4U Corsair, which offered significantly better performance and was already in service. With the performance estimates unmet, the Navy canceled the XF14C-2. 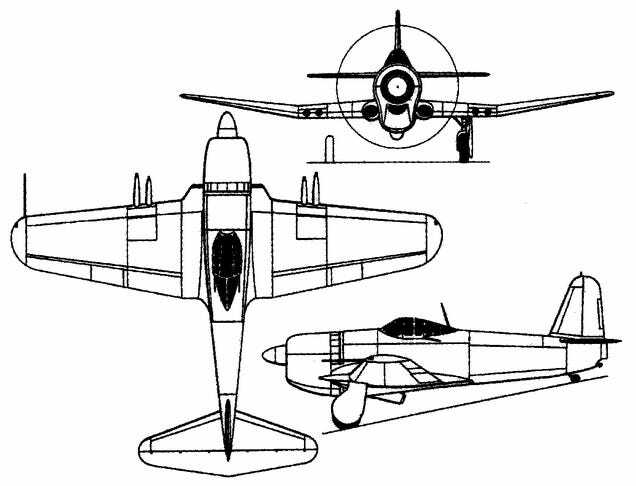 Concurrent with the XF14C, Curtiss had also been working on the XP-62, a similar fighter for the US Army Air Forces. The XP-62 featured a pressurized cockpit for high altitude missions, and Curtiss pitched this aircraft to the Navy as the XF14C-3. But the Navy wasn’t interested, the Army passed on the XP-62, and both aircraft were relegated to the scrap heap. For more stories about aviation, aviation history, and aviators, visit Wingspan. For more aircraft oddities, visit Planes You’ve (Probably) Newver Heard Of.